Very few things in life are better than Southern-style chicken and waffles. Let me tell you why. First, it's a texture thing. The waffles are soft on the inside and crunchy on the outside, just like a good piece of fried chicken. Then, there are all the flavors. 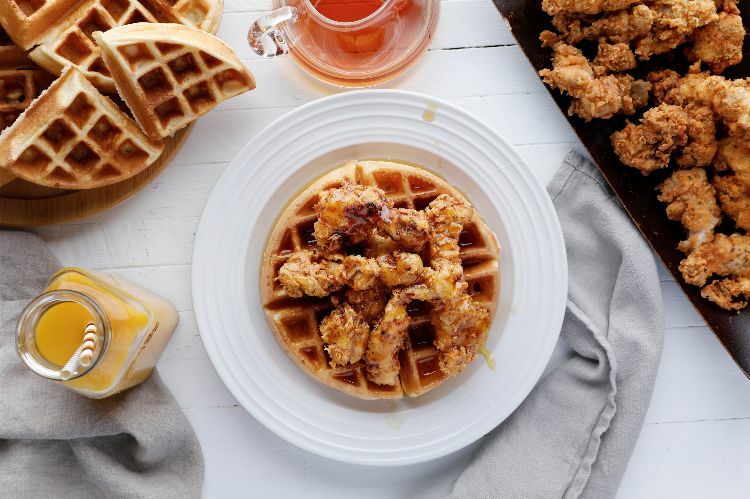 The waffles soak up all the sweetness from the maple syrup, which presents a stark contrast to the super savory flavors of the fried chicken. The recipe below perfectly represents all of that, and it's not too difficult to make, either. Buy store-bought chicken tenders if you want to keep things really easy. The recipe, however, calls for boneless, skinless chicken thighs. That allows you to make your own tenders at home so they are significantly less expensive and super juicy. The secret is soaking them in buttermilk for at least an hour before frying them. Place the chicken, buttermilk and hot sauce in a large bowl. Cover with plastic wrap and allow to marinate in the refrigerator for at least an hour (or as long as overnight). In a large bowl, combine the flour, salt, Italian seasoning and paprika. Heat 3 inches of oil in a large, high-sided skillet over medium-high heat until it reaches 350 degrees F.
Dredge the chicken pieces in flour before placing them in the hot oil. Cook, flipping once, until the chicken is golden brown on both sides, about 10 to 20 minutes. Keep the chicken warm in a 200-degree oven while you continue frying and make waffles. In a large bowl, combine the Bisquick, milk and egg. Spray the hot waffle iron with the nonstick spray and pour in the batter. Cook according to the waffle iron instructions, about 5 minutes or until the steaming stops. Serve the fried chicken on top of the waffle and top with maple syrup.